Wildlife Control Knoxville: How Do Raccoons Get Into An Attic? How Do Raccoons Get Into An Attic? As you lay awake in your bed in the middle of the night, listening to the sounds of claws traipsing across your attic floor, you might be asking yourself, “What is that and how the heck did whatever is creeping around up there get into my house?” Raccoons are very active here in Knoxville, so chances are, those noises are being caused by one or more raccoons who have found their way into your attic. Raccoons love attics because they provide warmth, shelter, and plenty of materials to build a comfy nest for their kits. 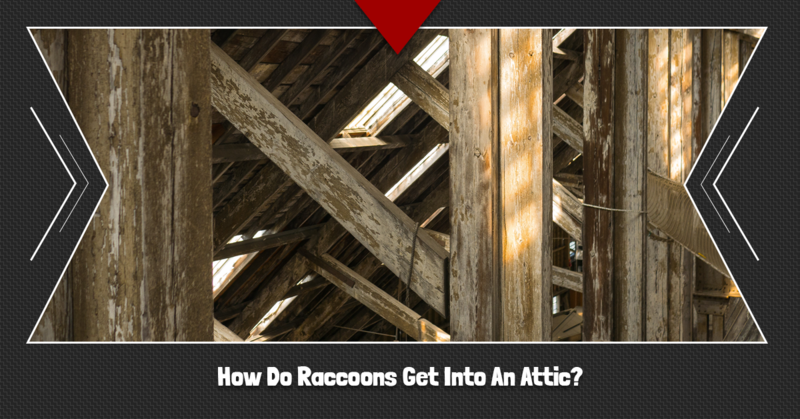 But how do raccoons enter your attic, and how can you get them out of there? Today, the friendly wildlife removal team at Critter Wranglers will share a few ways raccoons can enter your home, which can help you safeguard your home from a raccoon invasion and keep them from coming back once they’ve been removed. Want to get rid of the raccoons in your attic? Contact your full-service, Top Rated Local® raccoon removal team in Knoxville to schedule a wildlife removal. How Do Raccoons Get Into Your Attic? There are a number of ways raccoons and other wildlife can get into your home. Here are the top points of entry for raccoons. A damaged roof is an open invitation for raccoons and other wildlife to enter your home. Whether there is damage to the roof edge — where the eavestrough meets the house — or even to the roof vent, raccoons can easily enter your home through these openings and take up residence without you even knowing it until it’s too late. Roof vents are typically located on the top of your roof and in the soffits where the roof overhangs the wall face. Roof vents are meant to encourage proper air circulation in your attic, but these often become points of entry for raccoons and other wildlife seeking shelter, especially during the winter months when temperatures plummet. An RSI is anywhere the soffit sits right above the roof and is typically found on houses with multiple levels. Raccoons can stand on the roof just under the soffit and use their sharp claws to tear a hole or enter through an already damaged soffit. Raccoons are strong, determined creatures and will even use their shoulder strength to push through the soffit to reach the warmth of an attic. They will then be able to come and go as they please. If a raccoon has identified an enticing environment that they can use as a shelter for a nest, they can severely damage a roof and other features of a home to get inside. Raccoons can easily rip off perfectly intact roof vents or use their sharp claws, body strength, and cunning to make their own entryway into your attic. These bandit-faced critters are incredibly cunning and will do what it takes to survive the cold winters, especially when they need a warm nest to raise their kits in the spring. Regardless of how raccoons got into your home, you’ll want to get them out immediately. That’s where we come in. At Critter Wranglers, we provide residents and businesses in Knoxville and Powell with Top Rated Local® wildlife removal. We specialize in safely and humanely removing raccoons from your property so you can feel confident that your home is free of raccoons. In addition to our raccoon removal services, we offer attic restoration so we can repair any damage raccoons have unleashed on your home. This service also helps prevent raccoons from re-entering your home. For full-service raccoon removal in Tennessee, call or click to schedule an inspection, get a quote, and take your home back from raccoons and other critters.